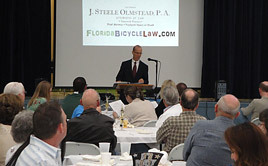 Bicycle Law FAQs - J. Steele Olmstead, P.A. Can I ride without a helmet? Sure. Can I have insurance on your life? Florida is the second deadliest place in the United States for cyclist. This is led by Orlando and Tampa where it’s down right scary in some places to be on the road on a bicycle. Do you really want to take that chance? You can fix broken bones. Broken brains… not so much. Here’s another equation: typical good helmet from a local bike shop is $60. The minute law enforcement shows up and you appear confused or disoriented after a crash, the officer will order you a free helicopter ride: cost: $13,000. When you get to the hospital, CT scans of your brain will be ordered, you will get some fancy monitoring equipment, may get an ice pack, etc. — average cost of questionable traumatic brain injury triage and initial treatment: $11,000.00 to $20,000.00. Izzat enough zeroes for you? Wear a helmet: it’s way cheaper and you get to keep your personality. Sure, but pedestrians have the right of way. Don’t forget call out to them that you’re approaching from behind. Always check with your local city ordinances. Some cities have opted to ban bicycles on sidewalks even though the streets have no bike lanes or there are no bike paths. Bad cities! Bad city of the month: Clearwater, Florida. No bicycling on the sidewalk there. Can I ride after I’ve been drinking? Did you really ask me that? See the bicycle laws section of our site. Bicycles are vehicles, like cars. So, you can get a ticket if you are drunk. Keep it safe, drive a bicycle sober. Wherever you want to really. Just act like a car when you are on the road: ride with the traffic, signal when you turn or stop, obey the stop and yield signs.. you know … car stuff. Ride the sidewalks unless your city says not to. Just call the local police and they’ll tell you. Oh, don’t forget there are miles and miles and miles and miles of car-free paved “rails-to-trails” trails and off-road parks in every county. I’ve just been in a bike crash. What should I do? If you have been injured, please seek medical attention immediately. If you have been in a collision with another vehicle (bicycle or motor vehicle), call 911 if you are hurt, and at the least, call the local law enforcement department to report the incident. Unless an ambulance is called and arrives first. If the cyclist (you) is injured, everyone involved in the crash must stay at the crash until law enforcement arrives. Get the information of the car or other party/parties, including name, phone number, address, insurance information, and license plate number (if applicable). If anyone stops and says they “saw the crash” or saw anything, get their name and all their contact information or at least take a picture of their license plate with your cell phone. You will be blamed for the crash. We always are. People in cars think they do nothing wrong. It’s simply too hard for them to accept you might be badly injured so they will twist facts/logic/rights/sequencing in their head to make the injured cyclist at fault. Do not argue with the other party/parties about who was in the right or get into a fight. You do not know if the other party carries a weapon, especially on the back roads or the road rage hot spots in Florida. Heated arguments can lead to confusion when law enforcement arrives, and participating in a physical fight can lead to your arrest. Best thing? Keep quiet, call me on my toll free number: 1-800-535-3002. If you are the victim of a hit-and-run collision, take down the license plate number (if applicable) and a description of the vehicle and its operator. Note the time and location of the incident and report it immediately to law enforcement. A decent cell phone camera can be a big help here. Once police arrive, do not argue with them if they take an action you disagree with (for example, if they ticket you when you believe you are not at fault). Be polite and get the officers’ names. I will make sure you will have the opportunity to present your side of the story in court. Law enforcement will generally not ticket the car driver and may not enforce the statutes. I am working on an act to pass in the legislature to correct this. Don’t worry if the officer fails to ticket the car driver. The law is still on the books and we can still use it in court. If you have been in a non-life-threatening collision that does not involve another vehicle, you can report it to police via a non-emergency number. Why would you do this? Many municipalities keep track of bike collisions and their locations to help them address problem areas. If poor road conditions (such as potholes or poorly constructed train tracks) contributed to the collision, consider informing the city or county’s road, street or public works department about the issue. If you have questions call me: 1-800-535-3002. 31 years experience in Personal Injury Law with specialized knowledge of bicycling injuries and Bicycle Law. He is not just a lawyer, he's an advocate: He is currently President of the Board for the Florida Bicycle Association, the premier education and advocacy organization for bicyclists in Florida. With expert knowledge of the Florida law and cycling, and a passion for both, Mr. Olmstead is a fascinating speaker for your group’s meeting.